Plaque will be unveiled in public ceremony on statehouse grounds Friday. 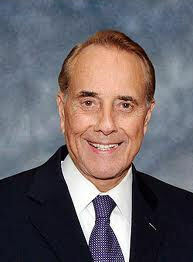 U.S. Sen. Bob Dole will be the first Kansan to be honored on the Kansas Walk of Honor. Sen. Dole and his wife, Elizabeth, will join Gov. Sam Brownback and his wife, Mary, to witness the unveiling of the bronze plaque on Friday at the southeast corner of the Statehouse south lawn. The 10 a.m. event is open to the public. The Walk of Honor will be located within the sidewalks on the statehouse grounds and will feature people who have contributed on a state and national level and have significant connections to Kansas. "It is important for Kansas to recognize those who have made incredible contributions to our state and nation. The Kansas Walk of Honor will raise awareness of the accomplishments of Kansans and help begin a discussion about civic duty," Brownback said. "It is fitting to acknowledge Senator Dole's outstanding civic duty. He dedicated his life to serving the public through his work in the military and as a statesman. I hope the Senator's many Kansas friends and supporters are able to join us for the unveiling." Kansas Historical Society Executive Director Jennie Chinn said the plan is for up to three plaques to be added each year to the Walk. "Those who wish to submit names of those to be considered for future plaques can send them to the Kansas Historical Foundation. A small committee will be appointed that will make nominations and selections," Chinn said. The Kansas Historical Foundation, a 501(c)(3), will serve as the caretakers of funds for the Kansas Walk of Honor. People can donate to this fund. The Historical Foundation, which supports the Kansas Historical Society, a state agency, will establish the Walk fund so that people can offer donations to cover the cost of plaques. The cost for each plaque is $2,000 including shipping.